SAP is the most widely used software for financial solutions. 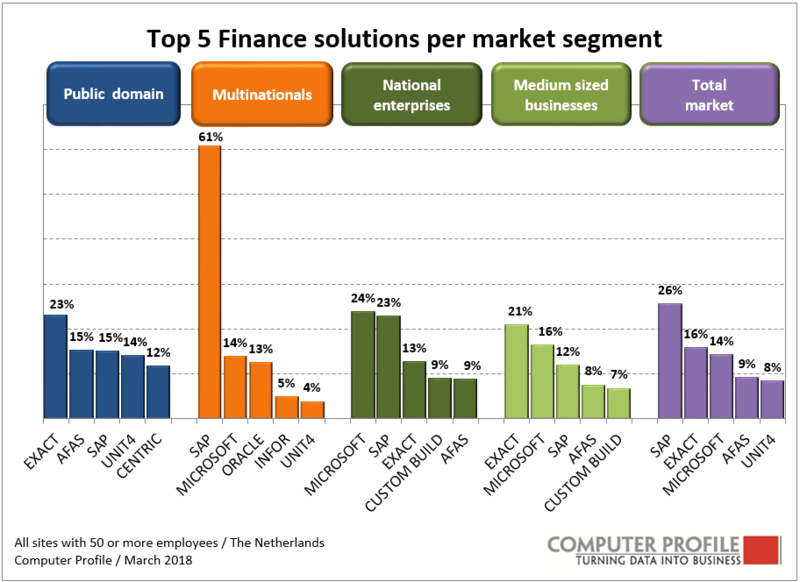 More than a quarter (26%) of all Dutch organizations from the commercial and public field with more than fifty employees indicate that they use SAP. This is shown by a market analysis by market intelligence specialist Smart Profile, where nearly 5,500 decision-makers of Dutch organizations were interviewed. 49% of all Dutch organizations with 50 or more employees have an independent financial package. When companies that have an ERP package and use the financial modules thereof for their financial administration are taken into account, the composite percentage amounts to 83%. When we zoom in on the sectoral level, governmental organizations and educational institutions use a dedicated financial package (not ERP) most frequently (62% and 60% respectively). In construction (54%) and manufacturing (46%) on the other hand, the financial modules of an ERP package are used rather frequently in support of financial administration. SAP is the solution used most widely across all organizations and sectors in support of financial administration (26%). This however is attributable in large measure to the fact that SAP is very strongly represented among multinationals, no fewer than 61% of which use the financial modules of SAP. The total picture is nuanced therefore, with EXAT being used most widely in the public sector and by medium-sized organizations (50-250 employees) and Microsoft among national companies with 250 to 2500 employees (see Figure 1). In addition to the aforementioned packages, the financial packages of AFAS and Unit 4 are also widely used. “The financial solutions market is mature and stable. There are few shifts to be seen between the different players,” says Erik van Gurp, business analyst at Computer Profile. Erik Van Gurp’s words are supported by the results of the market analysis conducted by Smart Profile. There has been a visible increase in financial solutions from the Cloud since 2010 (0.6% in 2010 to 8% at present). The trend is even faster paced in HR solutions, as 23% of organizations are now running their HR solution in the cloud. The tipping point in HR has already been reached, therefore, with 51% of HR solutions running in the cloud or at an independent data centre, compared with 48% local or remote (cf Figure 2). HR software are used at 62% of all business locations. If the HR modules of ERP packages are taken into consideration, this figure rises to 84%. Here once again, public and semi-public organizations use more independent HR solutions. In other sectors, HR tends to be more frequently part of the ERP package. 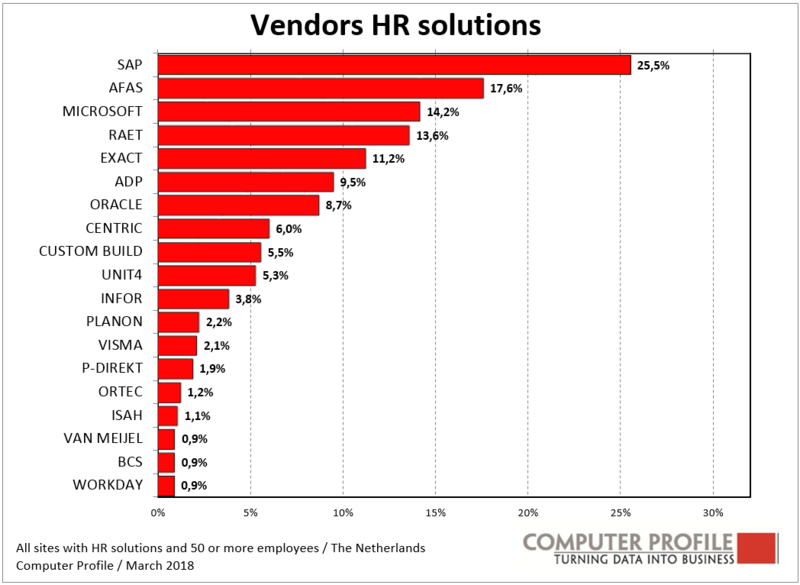 The results show a stable picture for HR solutions also. One of the positive outliers is AFAS. The use of the AFAS HR solution has increased each year since 2010, going from 5.4% in that year to 18% at present (see Figure 3).